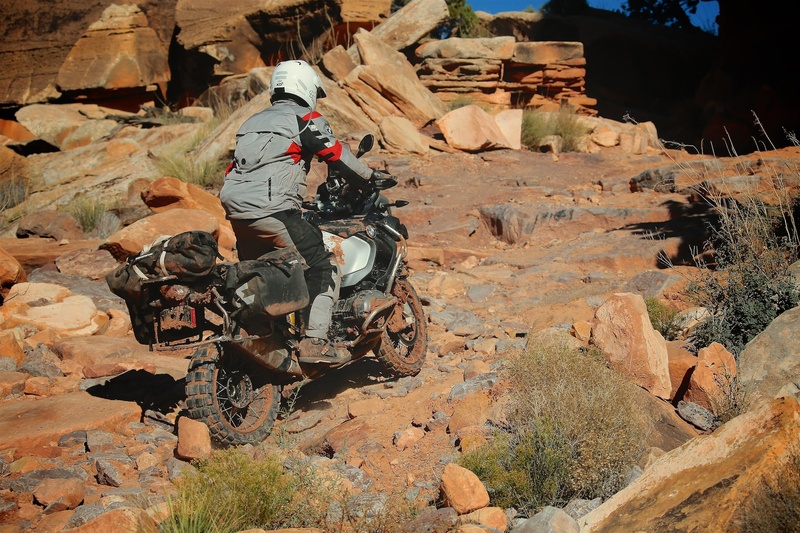 Sinuhe Xavier pilots the 2015 GS Adventure up a rock ledge in Canyonlands. 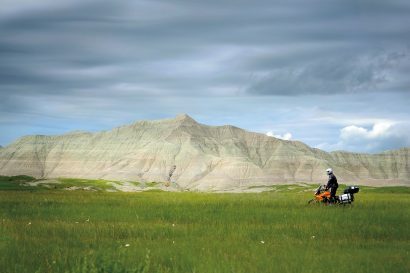 Each year we award for the ultimate adventure motorcycle, the bike that combines the best attributes and performance for overland travel. The 2015 awards proves to be the most contentious in years, with new offerings from KTM and a revised model from Yamaha. This also represents the last model year before the introduction of the Honda Africa Twin. I tested the field in a variety of conditions, from riding the length (nearly) of Baja with the new Yamaha 1200 ES to the mountains of the Pacific Northwest with the KTM 1290. Our time with BMW 1200s expanded to include extreme terrain across the Utah Traverse, culminating with Elephant Hill in Canyonlands. 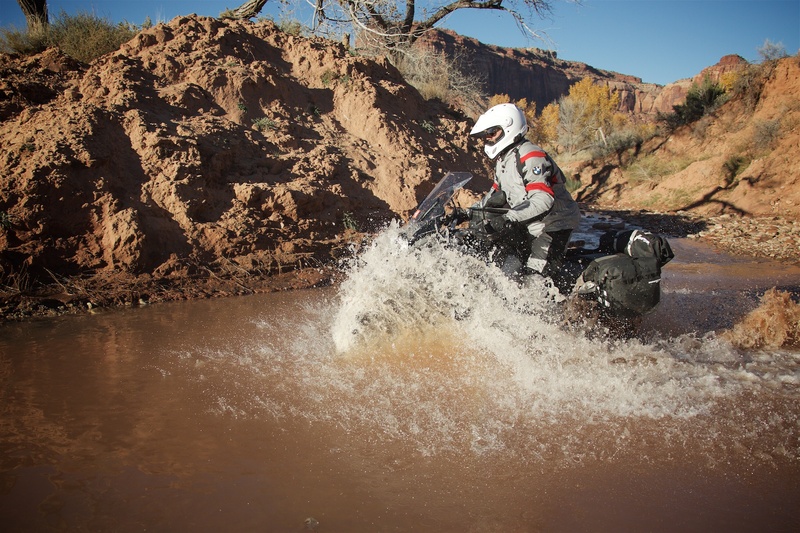 Input was collected from dozens of adventure riders, the result a near unanimous win for the BMW 1200 GS Adventure. The GSA inspires confidence for the rider, proving to be stable and sure-footed in technical terrain. The Enduristan soft luggage kept the gear dry. 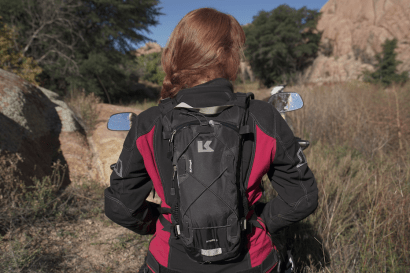 It is easy to isolate dirt performance for the adventure motorcycle, but that would discount the primary role a dual-sport plays for the traveler. We ride thousands of miles on pavement each year, enduring massive swings in climate and conditions, endless stretches of tarmac only softened with the activation of cruise control and a wide, supportive seat. 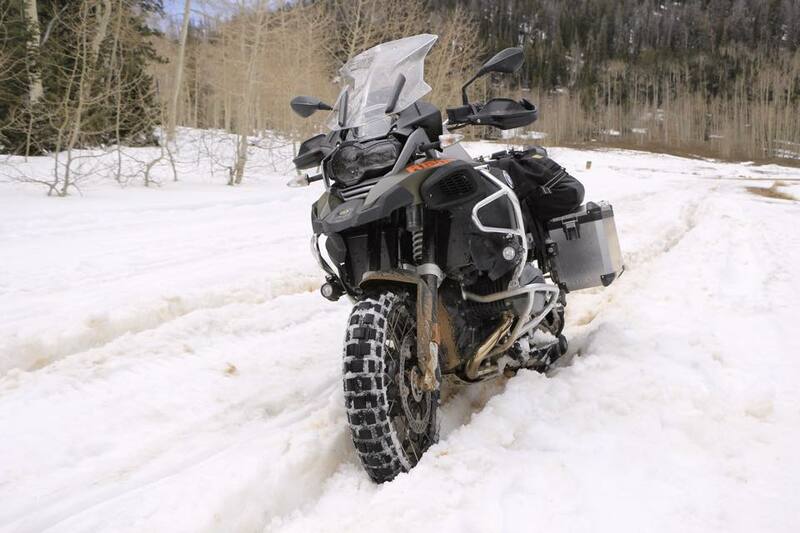 The KTM 1190 is a beast on the trail, but a long list of mechanical, reliability and design challenges have removed it as a consideration for expedition work. Durability and dependability is a primary consideration for any overland vehicle. The KTM 1290 is an impressive offering from the Austrians, but it has failed to manifest any significant advantage for travel over the trusted BMW water boxer. A few more years of proving reliability and we will certainly consider it a candidate. On the dirt, the 1200 GSA simply works, a byproduct of ergonomics, suspension design and the excellent traction control / ABS system. 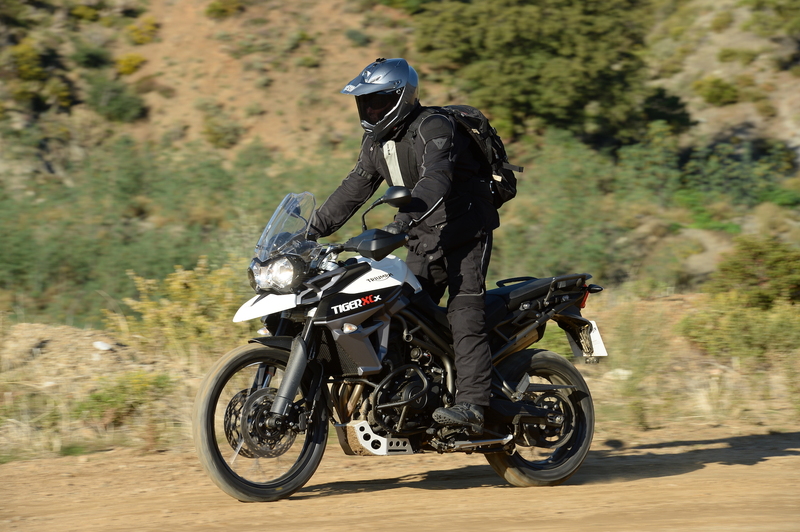 With over eight-inches of suspension travel, the GSA feels secure in technical terrain, rider control further aided by the lower center of gravity from the boxer motor. We compliment BMW for making the TKC 80 available as a factory tire option and for the fitment of trail protection and engine guards. 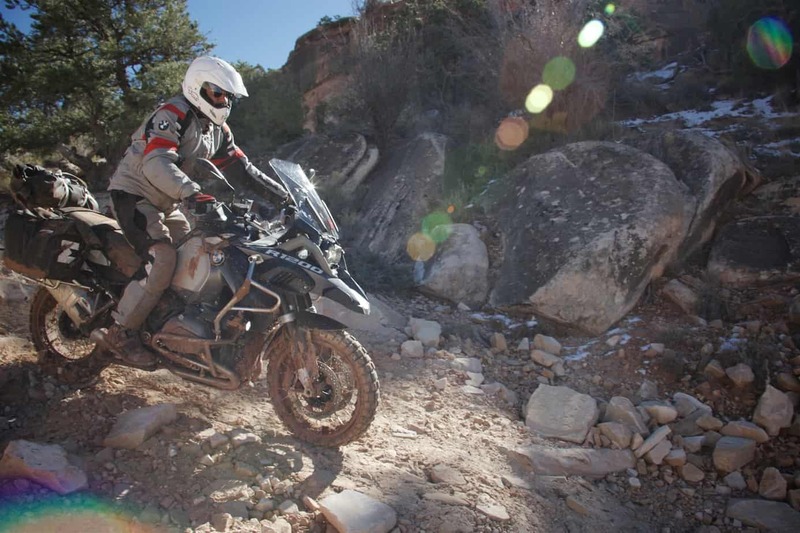 As travelers, we are not looking to win the Dakar, but it is important that the motorcycle is capable in a variety of terrain conditions and gives the rider confidence to explore further. Rain mode works well in snow. . . It is easy to put the KTM or the Yamaha as runner-up in this comparison, but sleeper from Triumph genuinely deserves it. 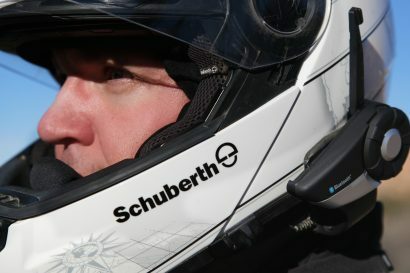 It is fantastic on the dirt, particularly at higher speeds. Low speed torque and clutch modulation is still a limitation to capability, but the 21-inch front wheel and long-travel suspension rewards the rider. On the road, the 800 is athletic and efficient, providing over 70 mpg and a 350+ mile range. The ABS and Traction Control are also impressive, allowing multi-mode and both dirt and street settings. The Triumph is a true performer, but lacks the edge on refinement and range over the 1200 GSA. The 800 XCX is dealt the runner up ultimately because of reliability concerns with the previous model and a limited international dealer network. The XCX also wins the value award for the category with the retail price of $13,499. If the new model proves reliable, maybe it will tilt our judges to the west side of the English Channel.